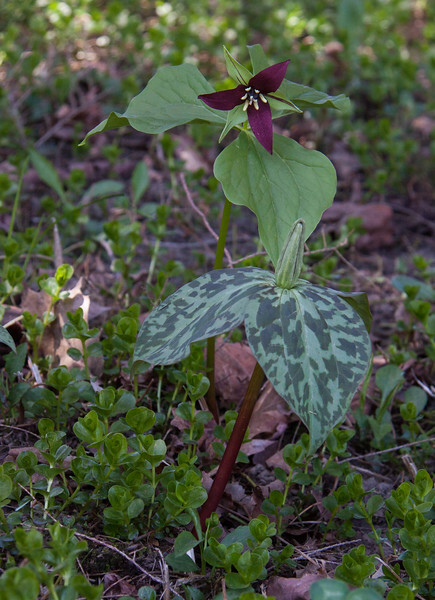 Trillium erectum, also known as Wake-robin, Red trillium, Purple trillium, Beth root, or Stinking Benjamin is a spring ephemeral wildflower in Phippsburg, Maine For a list of protected and endangered wildflowers in Maine see http://plants.usda.gov/java/threat Wildflowers should be left undisturbed where they are found. To uproot and attempt to transplant them puts the species at risk. Wildflowers are dependent on very specific soil, water and light requirements which a home gardener can rarely reproduce.